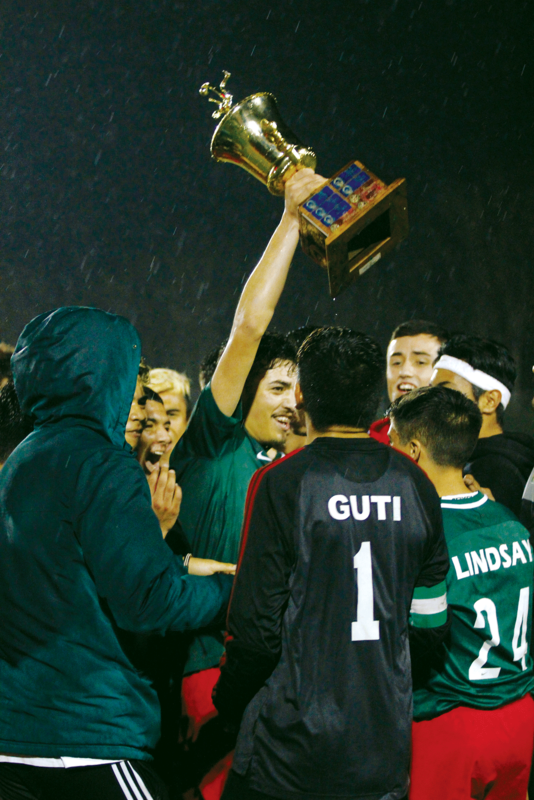 LINDSAY – The importance of the second leg of the Champions Cup was magnified on Friday, Feb. 1 as the Farmersville Aztecs and Lindsay Cardinals stood in first and second in the East Sequoia League. Similar to the first leg an additional 20 minutes was needed to decide the outcome. Silviano Loza holds up the Champions Cup after the Lindsay Cardinals defeated the Farmersville Aztecs 2-1 (2OT). Both 10-minute overtime periods were played and Lindsay (15-6-3, 9-2) wasted no time scoring the winning goal on a corner kick. In the attempt Lindsay moved defender Silviano Loza from the back line into the box. It’s a strategy head coach Tony Godoy has used in seasons pasted. “We have set piece where we move him up and use him as a set piece,” Godoy said. Lindsay kicked the ball directly toward the back post where Loza was able to head it into the bottom right corner to give the Cardinals the 2-1 win. “Overall it’s a win so I am happy for the team, but we should have scored more goals,” Loza said. This is the fifth year in a row Lindsay has won the cup over Farmersville. Although, overtime was needed the Cardinals had many chances to score the game winning score. In the 29th minute a shot from the top of the box bounced off the cross bar and directly down. The Cardinals, thinking it had crossed the line, lifted their hands in celebration, but there was no indication of a goal by the referee. A couple kicks later and Farmersville’s defense was able to clear the ball. Farmersville was primarily playing defense the second half. Jovani Ayala, the man in between the pipes for the Aztecs, and Farmersville’s back line withstood everything Lindsay tried. But it had to be in the back of the Aztecs’ minds that it was just a matter of time before the Cardinals found an opening. Farmersville had a couple offensive opportunities, but was unable to produce any threatening scoring attempts. 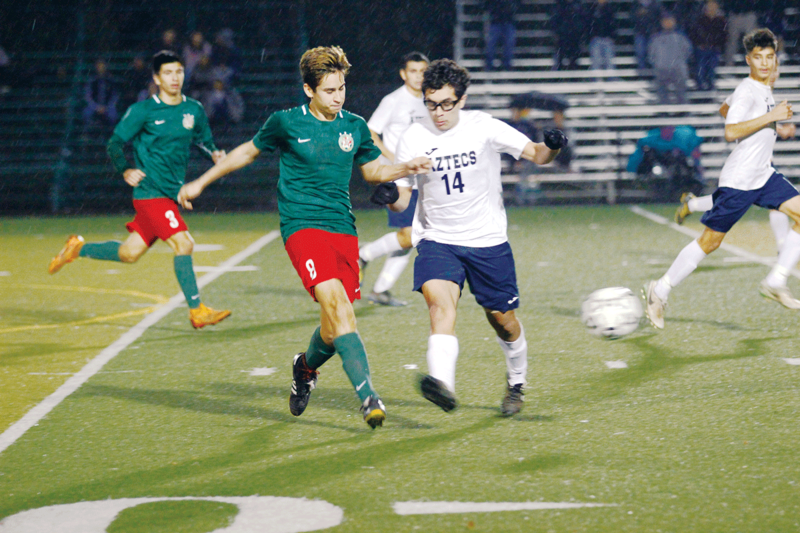 In the first half Moises Betancourt and Raul Carmona scored for the Cardinals and the Aztecs, respectively. The win puts Lindsay into a similar situation to last year. when a win over their rival, the Strathmore Spartans, pulled them back into first. Then a subsequent win by Lindsay and loss by Strathmore handed the Cardinals their seventh straight outright league title. One year later, and with one game remaining for each team Lindsay must win to capture an unprecedented eighth ESL title. If both teams win it will be the first time Lindsay shares the title during the streak. It will also be the first time the Cardinals have suffered more than one loss during ESL play under Godoy. A fact, which would upset other coaches, Godoy finds himself appreciative. The Cardinals remained at home last night against the Strathmore Spartans. Final occurred after press time. Also, last night the Aztecs made the short drive up to Woodlake to take on the Tigers. Those results were also reached after press time.